Fetterman & Associates provide evaluation services nationally and internationally. We provide professional evaluation training, workshops, and evaluation consultations. We also develop user-friendly tools to monitor, evaluate, and optimize your organization's performance. Fetterman & Associates work in schools, hospitals, business, and governmental agencies. The majority of projects are conducted within the United States. Selected examples focusing on the national level include work for Google, the U.S. Department of Education, U.S. Department of Health and Human Services (SAMHSA), and the W.K. Kellogg Foundation. In addition, Fetterman & Associates conduct state-level projects from Arkansas to California, and a variety of local level programs, including Portola Valley School District and Nueva in Hillsborough. 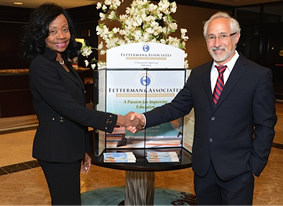 Fetterman & Associates also work in Australia, Brazil, Canada, Ethiopia, Finland, Israel, Japan, Korea, Mexico, Nepal, New Zealand, South Africa, Spain, Thailand, and the United Kingdom. Clients include: Arkansas Department of Education, Arkansas Department of Health, California Department of Education, Casey Family Programs, Family & Children Services, Google, Health Trust, Hewlett Packard, Knight Foundation, Poynter, Stanford University, UNICEF ,U.S. Department of Education, U.S. Department of Health and Human Services, Volunteers of America, and the W.K. Kellogg Foundation. Dr. Fetterman, President and CEO of Fetterman & Associates, has 25 years of experience at Stanford University, in administration, School of Education, and the School of Medicine. He is a member of the faculty of three universities. He has received numerous awards, conducted large-scale evaluation projects, published several books, and made contributions to a variety of encyclopedia. His articles appear in Academic Medicine, American Anthropologist, Educational Evaluation and Policy Analysis, Educational Researcher, and JAMA. His op-ed pieces appear in newspapers and blogs online throughout the United States. He is frequently requested for radio interviews, focusing on philanthropy, nonprofits, and evaluation. As such he is a much sought after speaker in the areas of evaluation, technology, motivation, management, and learning. He maintains an active speaking schedule in addition to designing, managing, and supervising evaluation projects. The agency provides evaluation consultations, technical assistance, and workshops for both developing and mature projects and programs. Dr. Fetterman also provides a variety of webinars to facilitate evaluation training.